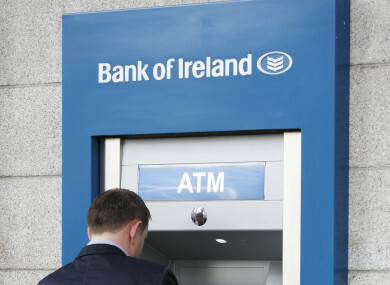 BANK OF IRELAND has imposed restrictions on many of its customers’ debit cards this week, amid fears they could be targeted by fraudsters. It is understood none of the affected customers have been victims of fraud, but the bank is taking precautionary measures due to recent “high-profile data breaches”. The bank also did not disclose the amount of customers affected for security reasons. Customers who’ve been affected can use their cards abroad but only with chip and pint. Foreign contactless payments have been stopped. Those affected received a text to inform them of the issue, with a follow-up letter to be sent out to the customers. In one post on Twitter, a customer said she’d received a mail during the week to say there’d been suspicious activity on her ATM card and that the bank was issuing her with a new one. “No action required by me and current card would remain valid – but it’s not being accepted for transactions,” the customer said. A spokesperson for Bank of Ireland told TheJournal.ie: “As part of Bank of Ireland’s proactive customer care approach, when we suspect that a debit or credit card may have been put at risk of fraud we take precautionary measures and issue customers with a new card… Receiving one of these precautionary messages does not mean that your card has been used fraudulently. In some instances we issue new cards to customers as a fraud precaution measure. Currently there is heightened precautionary activity due to the increase in third-party data breaches, for example Ticketmaster and Marriott Hotel Group data breaches. The spokesperson reiterated that customers can still use their existing card at ATMs or in shops using their pin. “Online and contactless functionality is temporarily removed from a customer’s card due to the potential for fraud,” he said. We understand that this is an inconvenience however it is temporary and implemented in order to protect the customer from fraud. Email “Bank of Ireland restricts contactless and online payments on some debit cards due to fraud fears”. Feedback on “Bank of Ireland restricts contactless and online payments on some debit cards due to fraud fears”.